St. Jerry Payne, left, and Officer Bryan Hill, second from left, both of the West Virginia Department of Natural Resources, chat with Ohio DNR officers Roy Rucker, second from right, and Jeff Cramer while they were gathered Monday morning with members of the Gallia County Sheriff’s Office, the U.S. Coast Guard and Gallipolis Fire Department personnel at the Public Use Area in Gallipolis. They were there to get the word out about the dangers of driving a boat while under the influence. All of the aforementioned agencies will be out in full force this weekend and for the remainder of the boating season. GALLIPOLIS — There was no rescue operation Monday morning on the Ohio River. Many folks who gathered along First Avenue in Gallipolis saw watercraft owned by several area law enforcement and rescue agencies gathered in the Public Use Area below First Avenue in Gallipolis. The U.S. Coast Guard even arrived and docked nearby. 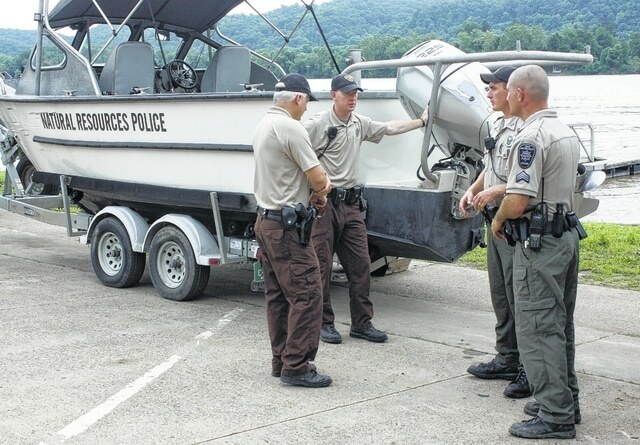 While there was no rescue operation, the gathering of officers from the Gallia County Sheriff’s Office, Gallipolis Fire Department, the Coast Guard and state natural resource officers from Ohio and West Virginia was meant to help prevent, as much as possible, such an activity. That’s why they’re bringing attention to a year-round initiative — Operation Dry Water, a nationwide crackdown on boating while under the influence of drugs and/or alcohol. The initiative will receive heightened attention this weekend when officers will be conducting BUI enforcement patrols, as well as arresting people who drink or use drugs, then decide to pilot a watercraft. The goal is to educate the public about the dangers of boating under the influence. “In an effort to protect the public, we are looking for impaired boat operators year round. Operation Dry Water weekend is a nationwide effort to increase public awareness about the dangers of impaired boat operation,” said Sgt. Jerry E. Payne, West Virginia Department of Natural Resources supervisor for Mason, Putnam and Kanawha counties. Piloting a boat while under the influence on the Ohio River is something he said should never happen. “If one person is BUI on the Ohio River, then it’s a problem,” he said. According to Lt. j.g. Tim Lovins, chief of the response department at the U.S. Coast Guard’s Marine Safety Unit in Huntington, small pleasure craft have been known to cause collisions with commercial vessels on the Ohio River. According to statistics provided by the National Association of State Boating Law Administrators, more than 6,950 local, state and federal officers from across the country participated last year in Operation Dry Water. Over the three-day weekend in 2014, law enforcement officers contacted 58,670 vessels and 146,711 boaters, made 318 BUI arrests, and issued 18,607 citations and warnings for safety violations. The Ohio River and nearby lakes will be closely monitored and patrolled to cut down on BUI incidents. According to Rob Lucas, of the Ohio DNR, this weekend’s heightened event is no different than any other summer weekend on the Ohio River. According to NASBLA, alcohol use is the leading contributor to recreational boating deaths. Last year, alcohol use was a factor in one-fourth — or 21 percent — of boating fatalities. Also, the group says “environmental stressors” associated with boating, such as rocking of the boat, sun, wind and noise, all intensify the effect of alcohol on a person while boating. Because of this, a boater is likely to become impaired more quickly on a boat than on land. Officials with the group also said both operators and passengers increase their chances of slips, falls overboard or becoming involved in a serious boating accident by consuming alcohol while boating. Law enforcement officials added that, in addition to alcohol, boating under the influence also applied to drug use and controlled substances. Lovins said the U.S. Coast Guard will be assisting local law enforcement in patrolling waterways in the Ohio Valley. “In an effort to raise awareness and deter operators from intoxication, Coast Guard officers will be conducting BUI-focused enforcement on random waterways at random times, both day and night,” he said. According to Lucas, there were no BUI violations last year on the Ohio River in Adams, Scioto, Lawrence, Gallia and Meigs counties.